Two times I have been told by professional strength & conditioning coaches that I had an amazing squat – which I must credit my amazing ankle mobility for these squats! But if my squat was so amazing, then why did I seriously injure my low back twice while performing barbell back squats? For me, barbell back squats were KING when it came to strength training. I would actually skip “chest day” to do another day of squats! I appreciated the total body feel this royal exercise offered. But I was missing a huge component that I know now contributed to my low back woes. I can still feel placing the loaded barbell on my shoulders, pulling it tight into my traps, and pushing my chest out to create that “shelf” for rest the bar upon. I can even smell the two gyms I worked out at in my youth: my high school gym and the basement gym in a small Northern Wisconsin city. But, even more, I remember the feeling of that one squat I did as a Junior at the UW-La Crosse. It was my “warm-up” set, you know, 135lb for 10 reps just to grease the groove. Well somewhere in those 10 reps I felt a “snap” and experienced a weird “yank” in my low back that had me unable to stand upright and totally confused. How could this happen to me? I was told how great my squats were, I’m going to college for Fitness, and it was only my warm-up set. Two more times in my life I would be out of commission for a handful of weeks because of barbell back squats! It would still be some 13 years laters since my first incident that I would finally know WHY (I’m a very slow learner)! I was trying to create all this tension in my upper body, but I was not even focused on what was going on below. I know for a fact when I loaded the bar on my shoulders that there was absolutely NO tension in my lower body, my knees were soft and bent, and I would basically have a controlled fall to the bottom of the squat – only concerned with my legs getting me back up. What has become so clear to me now is how to grab the floor with my feet, plugging them into the ground, and generating so much tension in my thighs & glutes that I now have to literally pull myself down into the bottom of my squat. And that right there ladies and gentlemen is the secret to a better squat right away! Not one week or two weeks or one month later – but right now your squats will take on a whole new meaning! The way I see squats NOW are completely different than I did when I was younger. The best part is now I can use squats to actually help people in the way I always intended. I’d hate to burst your bubble, but if you’re not competing in powerlifting then placing a load on your back may not be your best option. 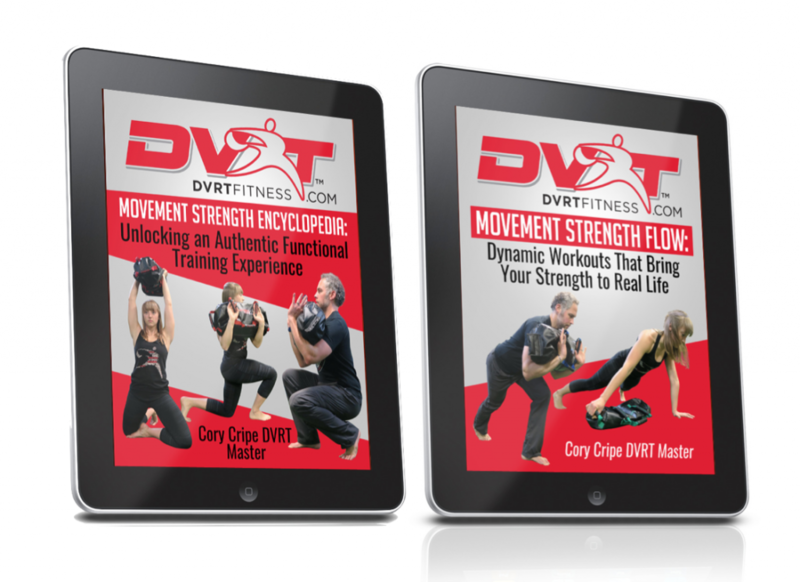 The magic of squatting using the DVRT principles and Ultimate Sandbag is the ability to create the needed tension on the top and bottom! Let’s go over three holding positions that will build better squats and stronger body! It’s important to grab the USB with a “lobster grip” and pull the material apart, always shooting for the widest USB you can make while pressing out. As you pull yourself down to the bottom of the squat you will simultaneously press the USB out and then as you press into the ground to rise up you will then pull the USB back into the starting position so everything arrives at the same time! Holding the USB close to us will create a different feedback than the Pressout Squats and will give some of you reasons to break out the Burly USBs! I like to tell our clients that the Bearhug Squats demands you go heavy with your USB selection. 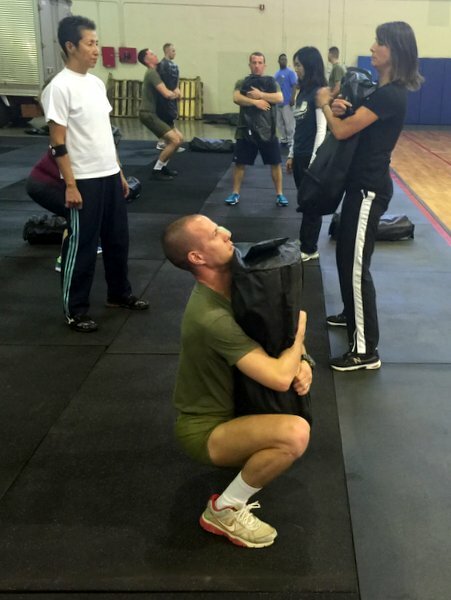 Now, when we’re hugging The Ultimate Sandbag we need to mean it! No passive hands and grips and no holding on to the opposite arm – you need to wrap your arms around the USB and with your Kung Fu death grip try to rip it apart as you pull it into your body! Maintaining that tension on the way down and even trying to rip and pull harder on the way up will give you the squat pattern you deserve with lots of feelings! This is one of the more popular holding positions for many DVRT exercises and hopefully learning the Pressout & Bearhug Squats will give you more feel on how to properly hold the USB in the Front Loaded (FL) position. Keeping your forearms vertical, pull the USB across the chest by squeezing the shoulder blades together – feel your elbows go down and in while your hands may spread a little wider than where your elbows are placed. You should experience an upper back engagement that barbells cannot offer! As you descend and pull yourself down to the bottom of your squat, maintain the tension with the USB against your body and at the bottom you may feel the need to lift your elbows a little to avoid your thighs – that’s OK just as long as you keep pulling the USB into your chest and keeping your shoulders down. Now here is where the magic happens! At the same time you’re driving your feet through the floor to rise up, feel yourself pulling up out of the bottom of the squat by pulling the USB tighter across the chest, squeezing tighter those shoulder blades! This tension through the upper back and feet has significantly changed the meaning of the squat exercise for me and I know you’ll experience the same change in your squat game, too! And this improvement of your squat will allow for more opportunities to add layers and challenges to this monster move! Squat Thrusters have been made popular by CrossFit and are a great combination exercise, but can be taken to a whole new level by changing your body position and the holding position! 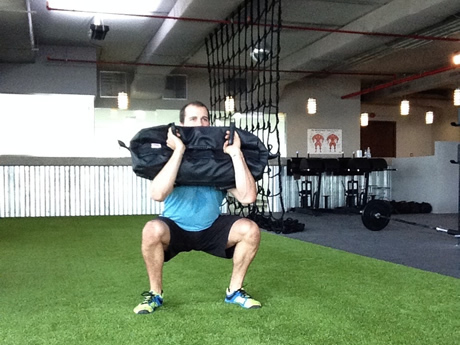 As a bonus, here are my three favorite Squat Thruster variations – enjoy!